Desertification includes land degradation due to both climatic and anthropogenic causes, where land includes water, soil, and the biosphere. This book presents the most recent findings from the European Community's MEDALUS project, which was formed to understand and manage semi-arid environments that are undergoing great change. 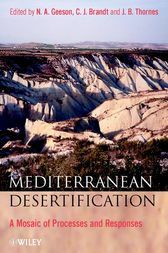 N. A. Geeson is the editor of Mediterranean Desertification: A Mosaic of Processes and Responses, published by Wiley. C. J. Brandt is the editor of Mediterranean Desertification: A Mosaic of Processes and Responses, published by Wiley. John B. Thornes is the editor of Mediterranean Desertification: A Mosaic of Processes and Responses, published by Wiley.